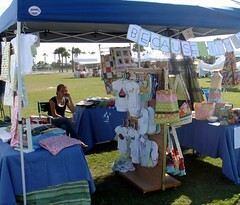 Our first outdoor craft show! 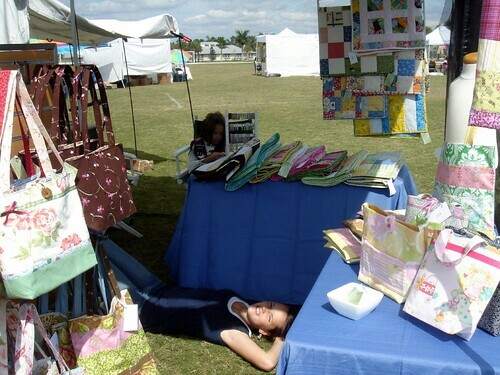 It was well advertised, the weather was decadent ... light breezes, not too hot, and enough cloud cover to keep it comfy ... , live music, good vendors ... a winning combination for a craft show. The only thing missing was customers. Grrr! Look at the pictures ... no customers! They did trickle in every now and then, it wasn't completely dead, but just not enough for anyone to do well. I'm not sure what the problem was. I asked the other vendors how this compared to other recent shows and they all seemed to agree that the economy is having an effect. Arts and crafts are luxuries, not necessities, and more people aren't able, or willing, to buy luxuries right now. I think, also, that I haven't found the right local venues yet for Because I'm Me. The majority of the shoppers today were older, not at an age to be buying baby items. They'd look, and comment positively, and then move on (hopefully after buying some of M.'s girl scout cookies!). I am going to look for more school organized shows and "funkier" shows appealing to more younger people. I spent a great deal of the day trying to figure out how to rearrange the booth. I did move the center rack out into the flow of traffic a bit (just about 12" outside of the tent) and that did attract more attention but I need to make the whole setup more accessible somehow. I'm not quite sure how to go about doing that, but I think a few trial set-ups in the yard should help. The girls and I did have a lot of fun. They enjoyed the music and even sang along. We had some great laughs and really enjoyed each other's company. Eventually they got bored. M. catnapped behind one of the tables, and, as you can see by the photo below, C. just plopped herself down in the middle of the booth ... no worries ... there wasn't anyone there to notice. No worries, the sales will come as you dial in on the right venue. Oh man, I can relate. I've had craft fairs like this. The problem in Hawaii is most people can't seem to tell the difference between imported junk and handmade stuff and so they buy the cheap imported junk. 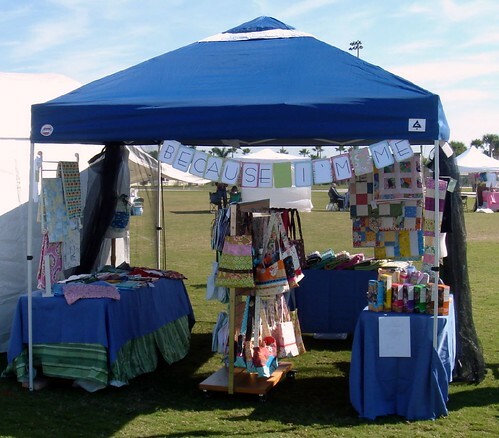 Your booth does look beautiful and I hope you find the right craft fairs. Some are just better than others. Oh Jody, I wish you could be in my area next Saturday. 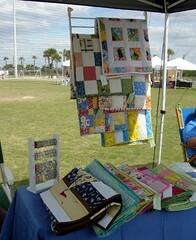 Our little city has a huge craft show twice a year - vendors come from all over. It's usually March and early November.